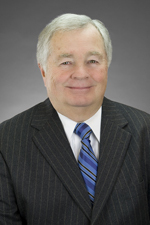 J. William Roberts is Senior Partner and serves as Special Counsel to management of Hinshaw & Culbertson LLP. He served as the firm's first national Managing Partner, from 1997 to 2016. Mr. Roberts maintains an active legal practice in the firm's Chicago and Springfield offices, concentrated in complex civil and criminal litigation, government relations and gaming law. Mr. Roberts' career has been dedicated to public service through several prominent positions in various levels of government. Mr. Roberts served as Chief Legal Counsel to Illinois Governor Jim Edgar from 1995 to 1997. As the primary legal adviser for the governor, he managed a large portfolio of litigation, and acted as liaison with the general counsel of executive branch departments, boards and commissions. He also had responsibility for numerous Illinois regulatory agencies, including the Illinois Gaming Board, Environmental Protection Agency, and the Departments of Public Health and Professional Regulation. Mr. Roberts served as United States Attorney for the Central District of Illinois from 1986 to 1993. During that time, he was director of the Banca Nazionale del lavoro (BNL) Task Force, a complex inter-agency investigation of criminal conduct related to $5.5 billion in loans made by the Atlanta branch of an Italian bank to Iraq before the 1991 Persian Gulf War. In 1992 Mr. Roberts also served as Chairman of the U.S. Attorney General's Advisory Committee of United States Attorneys and as a Senior Advisor to the Attorney General in Washington D.C. Prior to becoming United States Attorney for the Central District of Illinois, he was State's Attorney of Sangamon County. Mr. Roberts' professional activities are significant. He is a Director of the Illinois Supreme Court Historic Preservation Commission. He served for six years on the Board of Governors of the Illinois State Bar Association and as Chairman of the Criminal Justice Section Council of the Illinois Bar Association. Mr. Roberts served as President of the Illinois State's Attorneys Association and was a member of the Board of Directors of the National District Attorneys Association. He held the position of President of the Sangamon County Bar Association. Mr. Roberts has served as Chairman of the Task Force on Professional Practice in the Illinois Justice Systems. He is past Chancellor and a Founding Regent of the Illinois Academy of Lawyers. In addition, he is past President of the Lincoln Douglas Inn of Court. He served as counsel to the Minority Caucus of the Special Investigative Committee of the Illinois House of Representatives, which returned an Article of Impeachment against then Governor, Rod Blagojevich, in January 2009. In the fall of 2005, Mr. Roberts completed intensive training in mediation from the faculty of Pepperdine University School of Law's top-ranked Straus Institute for Dispute Resolution. In May 2006 Mr. Roberts was elected to the Board of Trustees of Illinois Wesleyan University. In 2003, he was the recipient of the University's Distinguished Alumni Award, which is presented annually to an alumnus who has made a distinguished contribution to society, has achieved professional distinction or has demonstrated civic leadership. Mr. Roberts is a life member of the International Chili Society.